Okay, update deployed, and generated new map. Hopefully the ore duplication is now taken care of. I dropped armor status and the compass from the client. I don't really use the armor status mod, but if you do, let me know, and I will put it back in. UE, MFFS, and RI have been removed just due to all the issues they are currently having. They just don't appear to be in a good state, so I figure we will give them some time. Added a bunch of mods and applied all of the updates I found. I also applied the latest Cauldron patch (209). I also added FastCraft as a clientside mod, and for me the client appears to run smoother. Powersuits got added to Dire's Pack last night, so they most have fixed what broke. It was suppose to launch with the pack, but got pulled at the last second. Yeah, we have been using the dev builds for MSP. We are currently on the latest release, posted on 10/31. The tinker table does not come up correctly in NEI. That is Chisel Acacia planks pattern going into the CB wedge. Btw, clear glass still doesn't work with the CB stuff. With most texture packs you do not need clear glass, as many use connected textures. Misa's pack is actually looking really nice on 1.7 with the glass. Best I have seen so far. It uses connected textures, but adds a very slight tint so that you can see the glass is there, but without really hindering visibility. I merged that as the base, with some of the mod support from Soartex, as Misa does not add mod support. I have not yet played around with the chisel mod yet, but it did look interesting, which is why I added it. 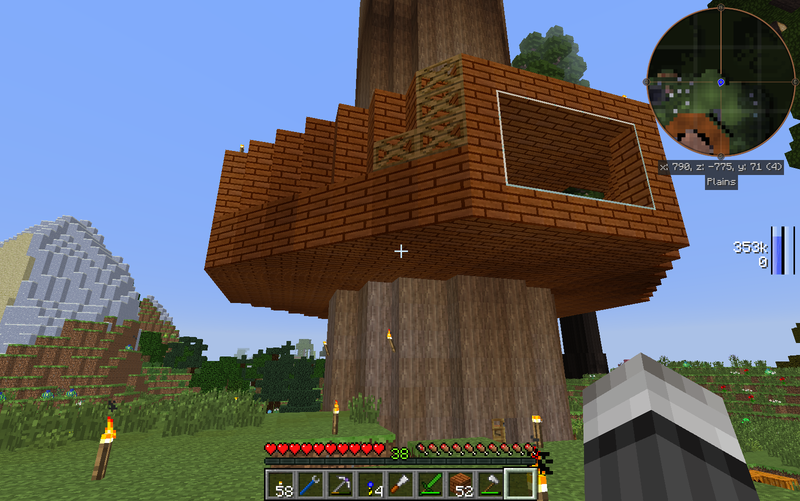 btw...where did those redwood trees come from, the one is the biggest I've ever seen. Looks nice. Need to find a good texture back for that mod, as mine does not currently have it. John and/or Jake probably planted the tree. I gave them op access on test so they could spawn items into the game, but I told them to do it away from us as we were playing survival. What do you think about moving this version to production? Also, I am planning on using GP like we had the 1.2.5 once we move to production. That way I can protect the area around spawn, plus it allows us to protect personal plots too. Yeah, I thought about both the Hats mod and morph. Maybe in the next cut, but I will skip it on this one. We've tried ruins before and it was a mess. The placement was buggy, and the locations just did not blend in well. What I think I might do for that is add a second world that I generate a bunch of dungeons with MCDungeon offline. I'll play with MPS a bit, as I did play with custom recipes for TE, and maybe that is what cause the issue. Hopefully I can get it done by tomorrow. Test will remain up until that time. Chunks have been generating all day on a seed I think will work well. Need to adjust the spawn point, and make a few adjustments to dynmap before opening it up. I will be doing that after work, so hopefully should have it up not too late tonight. Might be running a little slow though if it is still performing the chunk generation. Okay, whitelist updated. It's a little slow still, as the fill is at 80% Should finish in a few more hours. I turned off test for now to free up a little memory on the server, especially right now. I claimed a large area in the plain by spawn as an admin claim. We can always resize it later if needed. There is nothing there right now, and I am going to start outside of it for now, but we will subdivide it and set permissions later. Having problems with a filler in a my claimed area, tried the /trust [buildcraft] but that doesn't seem to work. Haven't found any other ideas on it yet. btw, I don't have premission to use the /help command. OPed [Buildcraft] to see if that might help. Please give it another try. I was having an issue with my filled near spawn as well. It would clear, but not fill. I also added the help permission, so that should work again.